Last week's summerlike weather provided an exclamation point on the end of the fourth warmest winter in the lower 48 states. Back in late December and early January as the winter was unfolding, I thought to myself that somehow we needed eerie music piped into the sky to give people some clue about how they should feel. In the Great Lakes area where I live, we are used to having snow dumped on us in copious amounts--or at least we used to be. I can remember as a child entire weeks given over to snow days with snow so deep we could build tunnels through it--much to my parents' dismay. But with each decade, winters in the Great Lakes Basin have become more and more mild. This winter was not just a one-off. And yet, it was the warmest since 2000, and so people have remarked about it. It's the nature of those remarks, however, that begs for the corrective touch of a haunting soundtrack. So often did I hear what a pleasant winter we were having. How lucky we Michiganders were to have this balmy reprieve from snowy discontents. Naturally, the winter sports enthusiasts were disappointed. But they seemed to chalk it up to freakish weather patterns that are not likely to repeat next year. We should take no comfort in the extremely cold European winter since climate scientists actually predicted this. They explained that the melting sea ice due to rising temperatures in the Arctic would favor "the formation of a high-pressure system near the Barents Sea which steers cold air into Europe." Back on my side of the globe, a friend in Texas reports that the multiyear drought there has gotten so bad that he is thinking about putting a diesel generator on his property to provide electricity during the expected brownouts and blackouts. This is because the continuing drought may force a number of electric generating plants to shut down for lack of cooling water from shrinking rivers and reservoirs. Environmental activist Vandana Shiva has rightly dubbed what we are experiencing as climate chaos. Predictable climate patterns are changing everywhere with unpredictable results. It is not always easy to pin down the causes of any specific weather pattern. And yet, the unprecedented rate of change in temperature and weather patterns worldwide should give us concern that the winter just past is but a preview of coming attractions. What the geologic record shows has previously taken 5,000 to 20,000 years to occur--namely, a 100 ppm rise in carbon dioxide concentrations in the atmosphere--has taken only 120 years in our era. What that implies is that in the past no single human being could have witnessed the kind of changes in climate we are now seeing in the space of a single lifetime or even a single generation. In a way we have become inured to rapid change. The ever increasing drumbeat of industrial civilization and technological change has made us think that rapid change is both inevitable and good. At least that's what we tell ourselves. So, when the rhythm of seasons is disrupted, it seems like just one more change. Of course, climate change isn't just one more change. And, it is the rate of change which tells us something is awry. It is the very fact that I can detect the general trend of warming winters in the Great Lakes in the course of my lifetime that ought to set off loud, buzzing alarms. Alas, there is no one in charge of providing suitable sound effects for me or anyone else that would convey the predicament into which we as a global society are now walking with our eyes wide shut. I say eyes wide shut because even though concern about global climate change is very high nearly everywhere except the United States, little is being done to address it. Earlier this month I highlighted two recent films which I thought captured the deepseated unease in our collective unconscious, an unease that is only rarely linked to our ecological predicament. The soundtracks of both were suitably eerie in keeping with the winter just past. But, it seems we'll need a lot more eerie music before the great mass of people will be able to hear the frightening silence of a winter in the snowbelt...without snow. 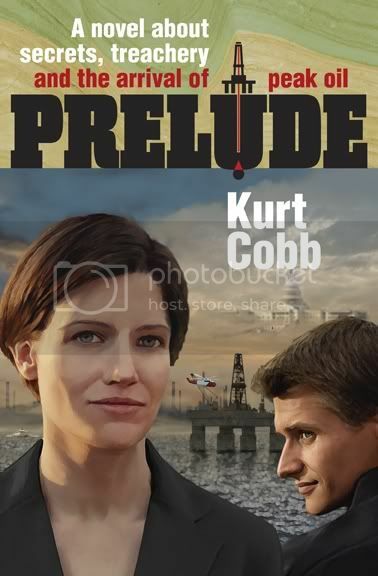 Kurt Cobb is the author of the peak-oil-themed thriller, Prelude, and a columnist for the Paris-based science news site Scitizen. His work has also been featured on Energy Bulletin, The Oil Drum, 321energy, Common Dreams, Le Monde Diplomatique, EV World, and many other sites. He maintains a blog called Resource Insights. PLEASE NOTE: If you are a climate change denier, you should read the comments policy for this blog before commenting. Climate change denial is one of our most serious problems today. A recent BBC Horizon also commented on why people are like this / why they have rose-tinted spectacles. Demonstrated was an experiment in which people were shown data about human mortality, then they were asked Q's about how mortal they might be. The responses showed specific and selective cherry-picking of data, to ignore the data they don't like / find too personal. Apparently every one in the population is a special case, certain to beat the statistics. Apparently, this happens in the sub-conscious. Conclusion: We have evolved to be optimistic - perhaps because those who strive, with hopeful expectation and actually succeed - will do better then the depressives who don't strive at all. Quote: "this inbuilt tendency to optimistically ignore starkly obvious risks has been essential to our success [as a species]". Good luck warning people; they'll refuse to 'get it' - it'll never happen, short of a world government with dictatorial powers. Plan to survive the worst. Anonymous 1 is right. Short of a world government with dictatorial powers, we will only be stopped by the wall we are heading to at high speed. Could Kurt's posts put a brake to that crazy run. We've actually had a warm spring here in Finland, winter was about normal but the fall was also warmer than average.